Replacing or installing a flex supply hose for your water heater couldn't be easier. Probite's Lead Free quick connect water heater supply hose comes in a variety of sizes and types. We offer a straight push connection, a straight valve supply line, or an angle valve supply line, all with quick connect technology! 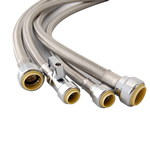 Looking for a specific type of supply line? Select from the different sizes in the box below or search our store for a different type.